honor this magnificent Earth we are privileged to call home. Where ever you live in the world it is also wise to remember, the very ground on which we stand is sacred ground. It nourishes and sustains our body and Being. It gives us each a place to laugh and love and play. A place to expand our consciousness and Awaken! 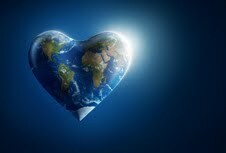 Today and everyday, walk gently on this beautiful Earth. Leave only your footprint of love as you journey through life. Previous PostPrevious Taurus new moon, free energy clearing, the benefits of cayenne, Rikka replay and more! Next PostNext Astrology update, Mars in Virgo, root canals, help for entrepreneurs, You Wealth Revolution and Abraham!